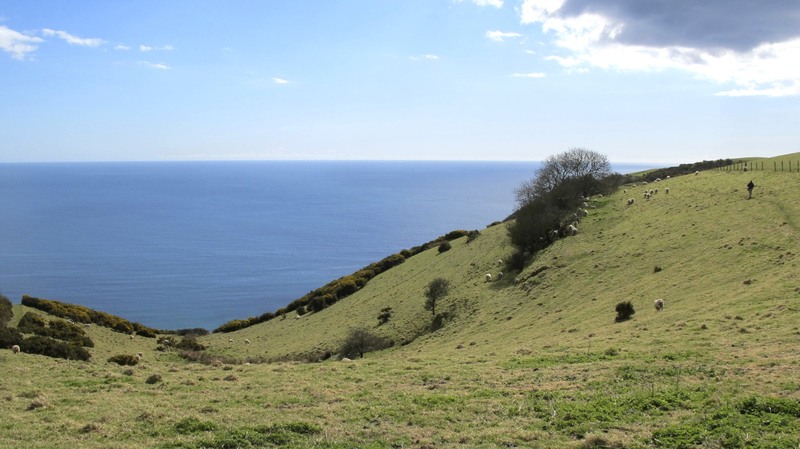 John and I set off yesterday on a coast path walk that was new ground for us. 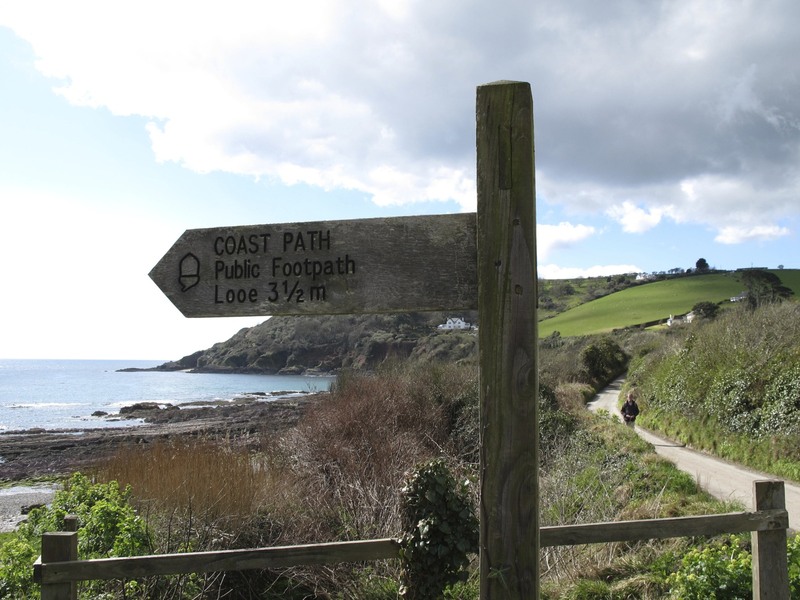 While we’d been to Polperro in the past, we had not walked the path we took yesterday. This shot reminded me of a trip I took the summer of my 20th year to the dusty Greek island of Ios. The lone tree with all the sheep around it took me straight back in time except it was cooler here and green, with the only dust being that our feet kicked up in a few well worn places when we picked up the path later. It’s always easy to spot when you’re in an area where you may run into sheep. 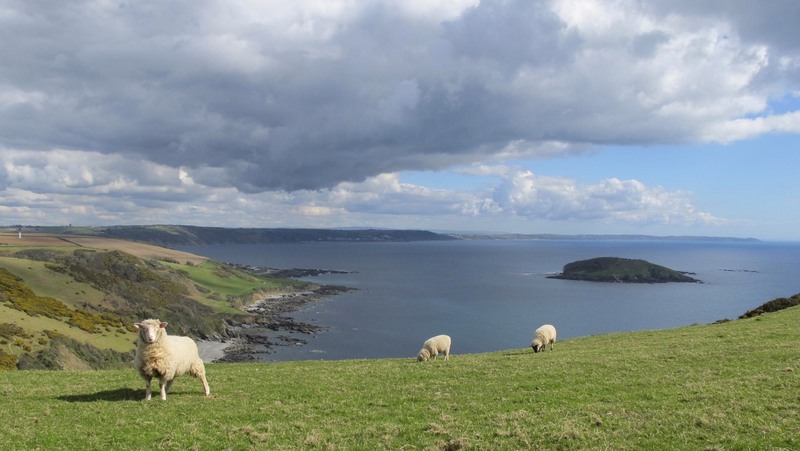 Walking the coast path can sometimes take you through farmers fields and while you are free to walk on the designated path, you must be very careful not to do anything that scares the sheep if you stray off it. 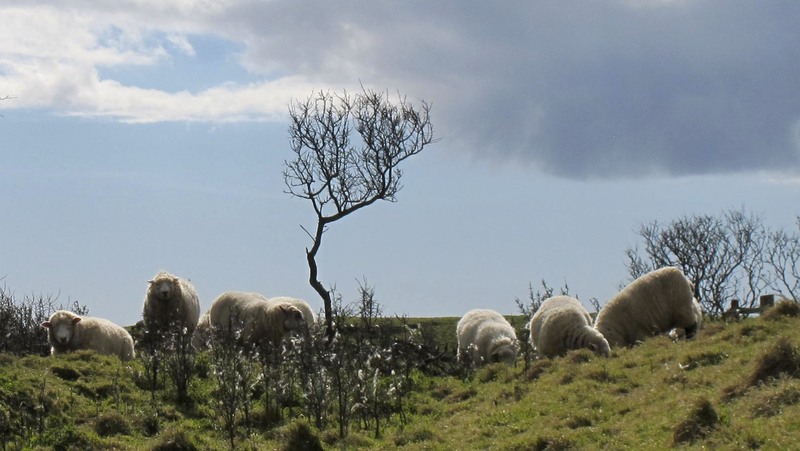 Dogs have to stay on a leash and there can be serious repercussions if a farmer catches a dog chasing the sheep. 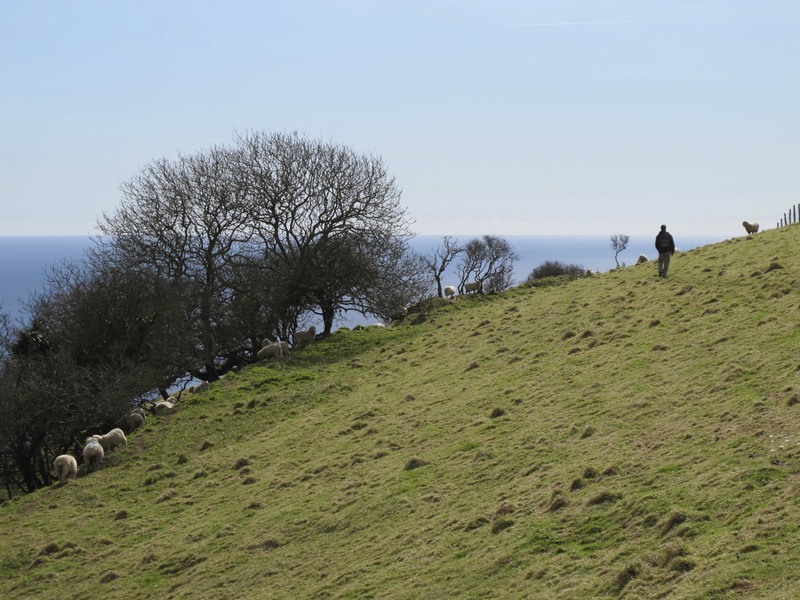 Sometimes following John can mean diverting from the path … ‘ Don’t mind us,’ I tell the sheep as we walk right through their seaside café. He can often get ahead of me when I linger to take … ‘ Just one more photo ‘ an expression he’s heard me use many times since we met. You can see John in the distance if you look to the right. Here’s another shot of John that I took while running to catch up. 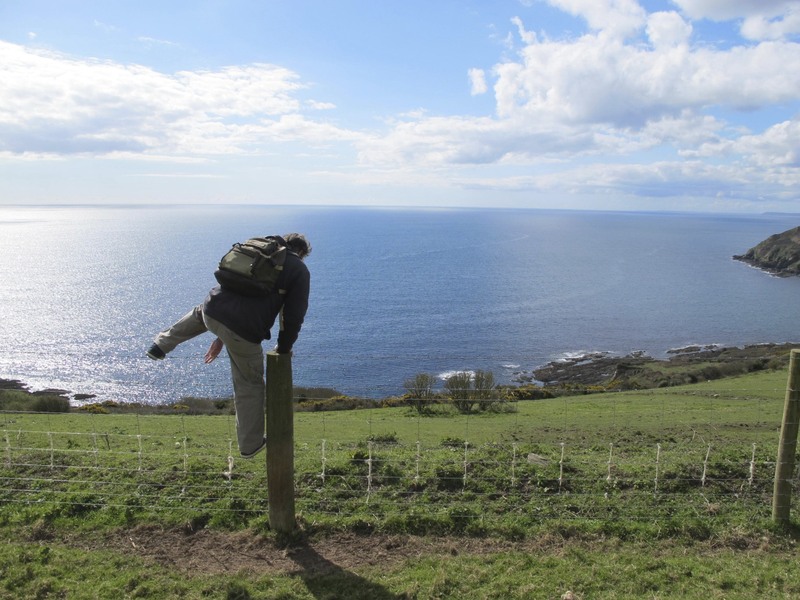 Because we were walking through a field, we had to hop a fence or two to get back on the coast path … John went first. Then I showed him my technique for climbing over barbed wire fences. 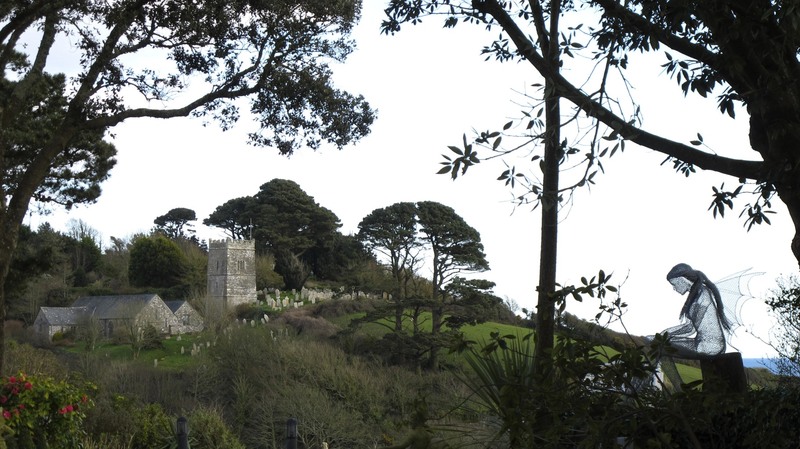 Not long after, we walked into this lovely space as we came down the coast path. I stopped to touch the nose of the chestnut colored horse on the way down to the beach. 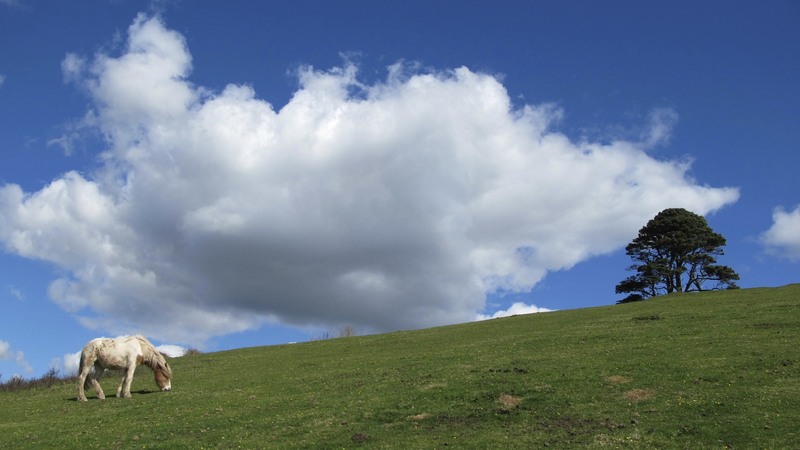 Before I went down, I turned back to photograph the horse on the hill. I liked the balance in the space between the horse and the tree. There’s John off to the right … waiting for me, again. This is one of my favorite shots of the day. 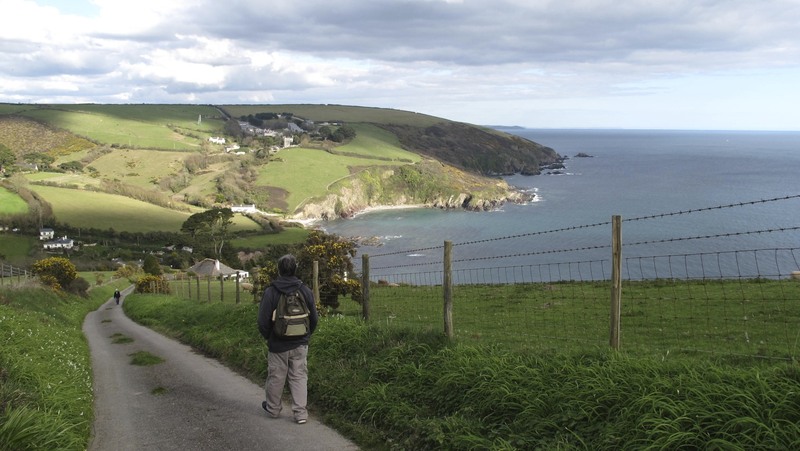 I loved the lines in this photograph … that’s John enjoying the view for a minute before continuing on into Polperro. 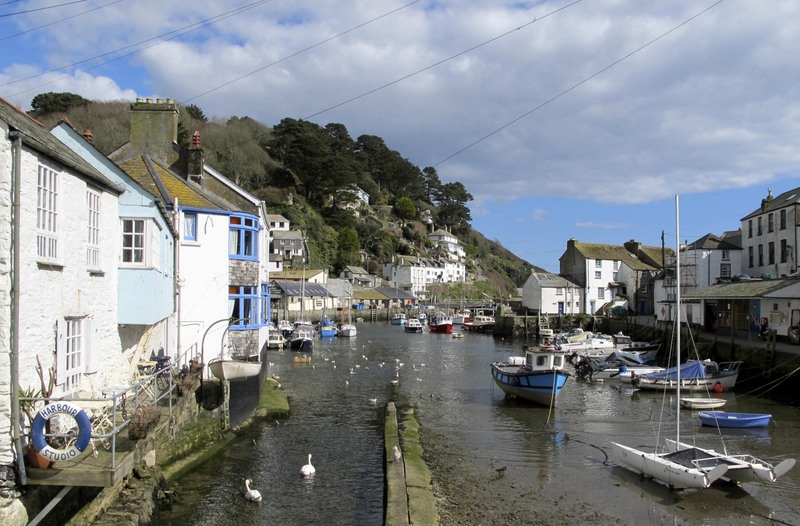 Polperro is one of my favorite fishing villages in Cornwall and is different from others in a few ways I’ll come back to in another post. We walked into the village next to the harbor coming from the direction near the tip of the trees you see slightly off-center in this photograph. 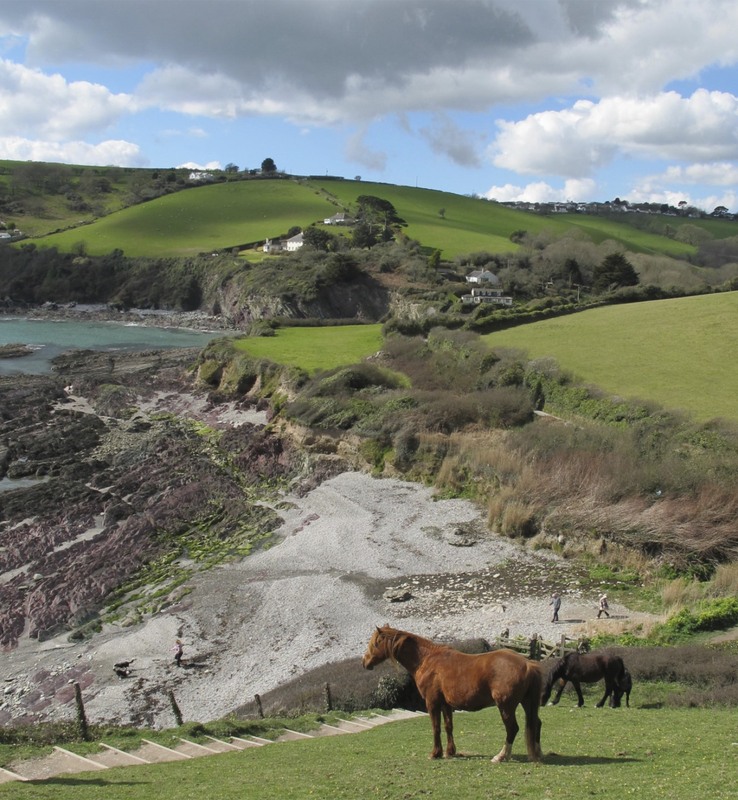 You climb up and down a lot of hills on the path to Polperro. We were halfway back to where we started by the time we reached this spot. 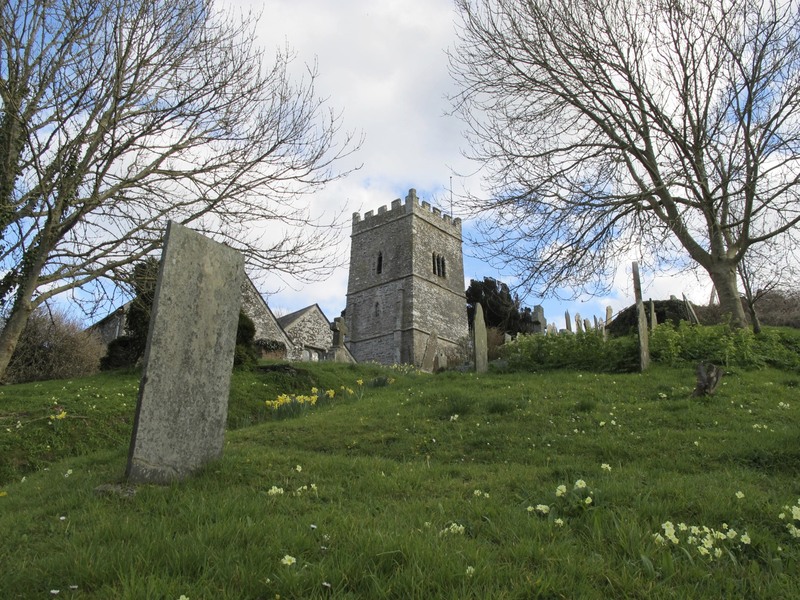 Our goal was a visit to the Talland Church on the hill before going on to where we left the car. From here it didn’t look as if we had far to go, but as anyone who drives through the lanes here will tell you, a quick trip can take longer than you think and even more so when you are walking rather than driving through the lanes. I was in a hurry to get to the church before the sun changed too dramatically as I was worried about losing the light. We took a wrong turn that carried us right past this view and I loved the way I was able to show the church and the fairy balanced in the same shot. After a few more hills we reached our destination, although not our final one of the day. 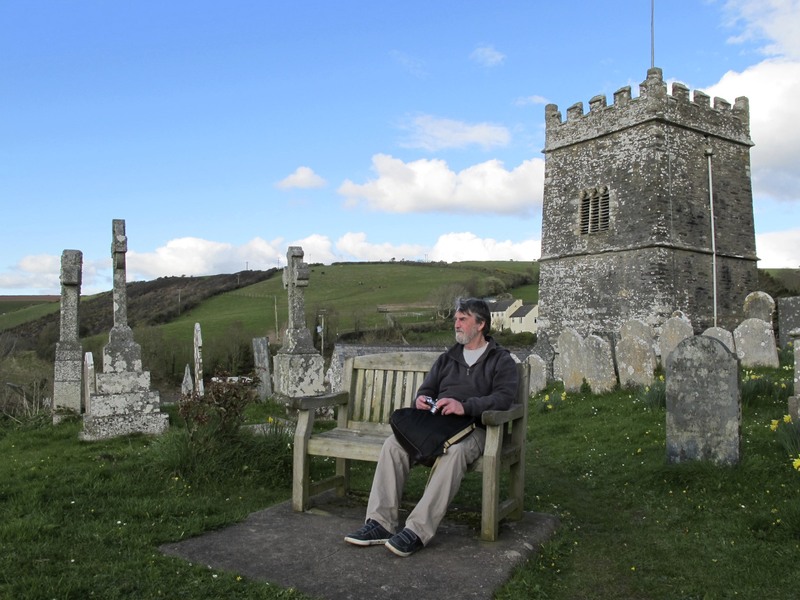 The church was locked which is generally not the case with village churches at least during the day, but we didn’t mind so much after finding a well placed bench with a view of the sea. This entry was posted in Adventure, Coast Path, Cornwall, Expat, Health & Wellness, Living in UK, Memories, Photography, Travel and tagged Coast Path Walks Cornwall, Cornish Churches By The Sea, Cornish Coastlines, Cornish Fishing Villages, Cornwall, Elizabeth Harper, Gifts Of The Journey, Greece, Ios, John Winchurch, Photography, Polperro, Sea Views, Sheep, Talland, Walking The Lanes. Bookmark the permalink. Your photos are spectacular! Thanks for sharing this beautiful slice of heaven! A great post Elizabeth. 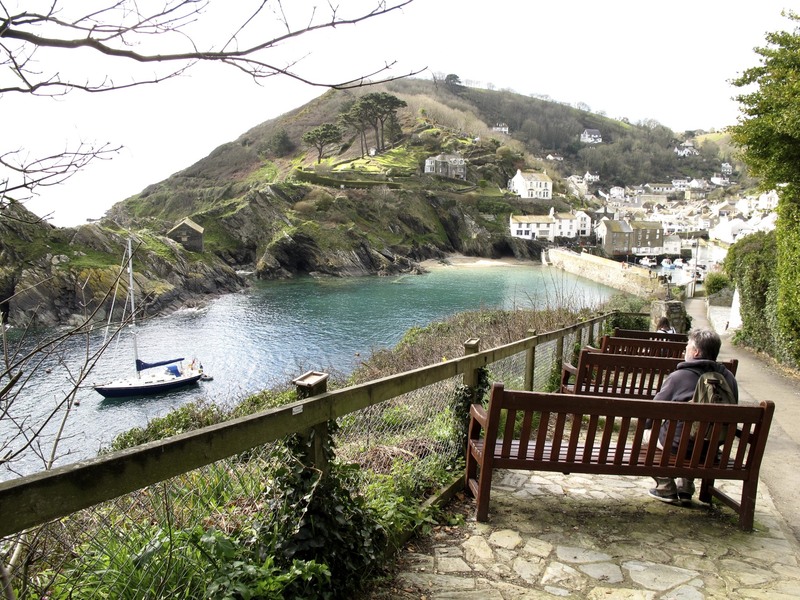 I visited Polperro years ago and have fond memories of my visit. 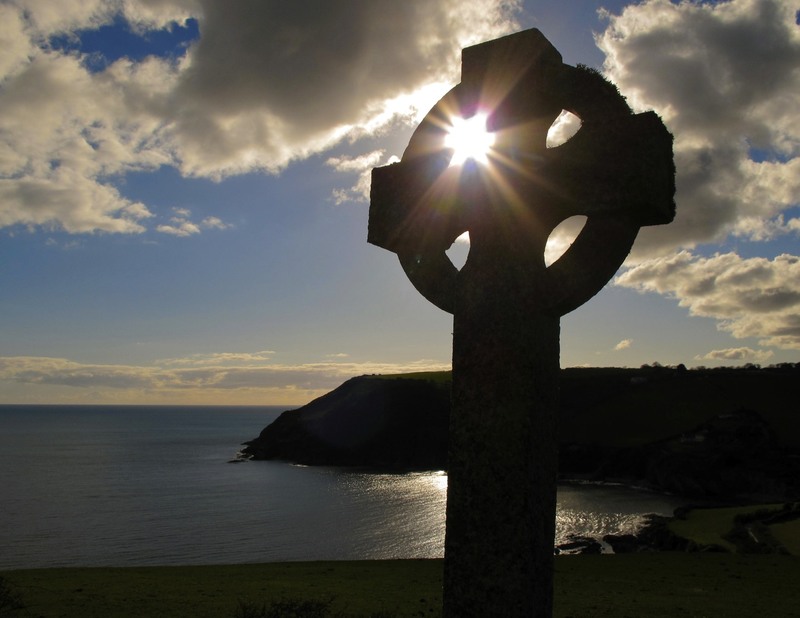 A couple of your pics reminded me of Iona on the west coast of Scotland especially the last one of the cross. What a beautiful place. I have always felt a connection to that land…and some day I shall see it. Loved.loved.loved this post and I want to tell you why I’ve been following your blog for over 2 years. I appreciate your adventuresome spirit and the challenges you’ve overcome, all of which you share in ‘your story’; your writing, as you are very gifed; your photography–another gift which you share; and your generosity to take the time to post all of this–putting it, as well as yourself ‘out’ here for your close friends and for the global community. I could go on and on. Instead I’ll scroll back and fill my spirit with the beauty you’ve just shared. The photos are simply stunning!! What a gorgeous place you live in! Makes me even more eager to explore that part of England…having only been to Cambridge, Bath and London. Lovely photos! Honestly, your best pictures EVER! There were a few in the middle (specifically the ones with the horses, the photo right above the horses and the one you stated was your favorite) that you should consider making into canvas prints. They would look great above your couch…pulls out the colors in your room (and the new pillows). Thanks for sharing your slice of heaven. Helen ~ I’m so glad you enjoyed them. Thanks for commenting. Brian ~ Funny you mention Iona, I’ve been there twice before and loved it plus the western coast of Scotland is just about my favorite place to visit. I used to want to live there, but there’s just not enough days of sunshine for me. Debra ~ You should definitely try to find a way to see this part of the world especially if you’ve always felt the connection. K-Sue ~ Your comment made me feel so good … flat out wonderful really! I get a bit teary even rereading it now and I want to thank you for taking the time to write what you have. I do spend a good bit of time putting together the posts and I absolutely love hearing that something I’ve shared either in words or photographs has affected those who read my blog. Thank you for making my day! Broadside, Catlin ~ Cornwall is so lovely and embarrassingly I never even knew it existed before meeting John four years ago. 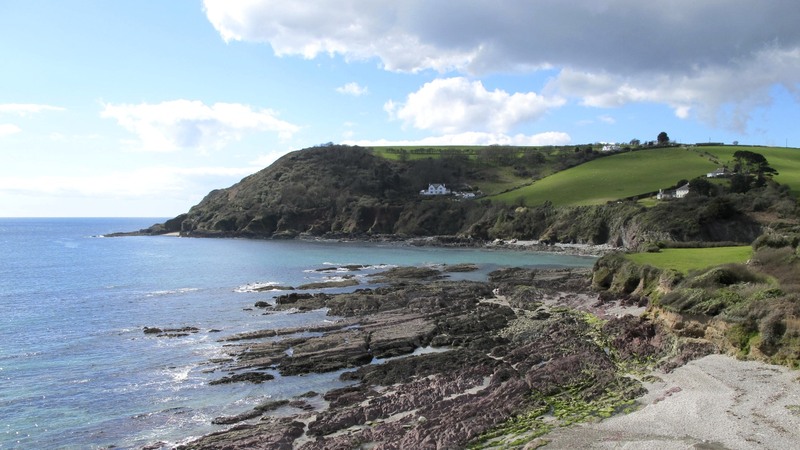 Like many Americans, I was more aware of the obvious tourist stops such as London, and parts of Scotland while totally missing the Lake District, Devon, Cornwall, and Wales. I put it down to our short vacations in the US and how we feel a need to see and do as much as possible when we manage to shake loose from work for a two-week stretch of time. Wendy ~ Thanks again for your kind comments about my photography … I’m always pleased when folks think something is good enough to put on the wall and I always appreciate you taking time to comment. It’s funny what you can capture with a little P&S camera and magical location. My Canon G11 stays in my hand the whole time we’re out walking something that’s possible because of its size. I mentioned the over the sofa idea to John and I’ll certainly keep you all posted if we go with one of my images. 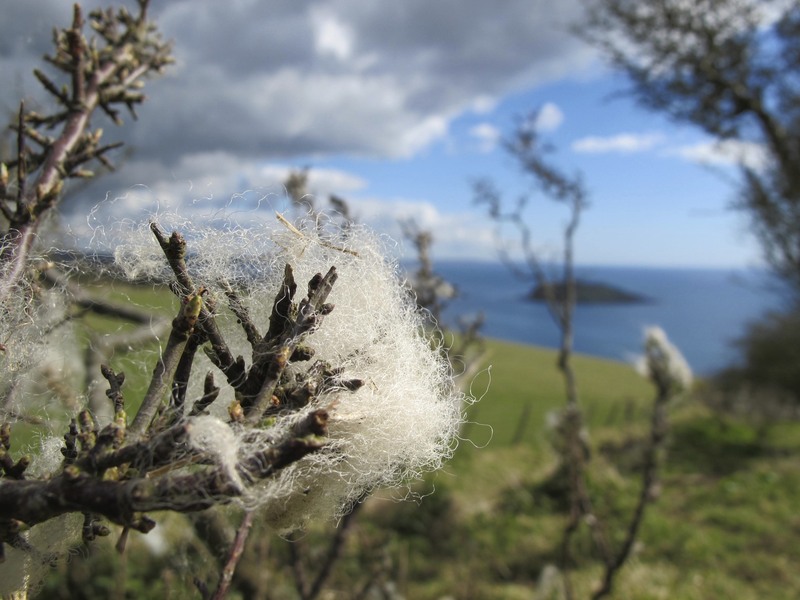 Brian is so right, it does look like Iona, but there is also nothing that beats a cumulo fluffyclouds of a Cornish Springtime day. thanks for the look at the breathtaking pictures ! I love being able to go for a walk vicariously through your pictures. Lovely. The one you called your favorite looks like it was taken with a fancy camera lens. It’s even more fun to know that it wasn’t. You are living my dream. I hope that you both know how lucky you are. To have found each other and to be together and healthy in that beautiful place. I’ve just come across your blog and so enjoyed your tour through the countryside. What lovely photos of a lovely place. Judy, I’m going to have to put on my detective cap and see if I can guess which place was your temporary home. 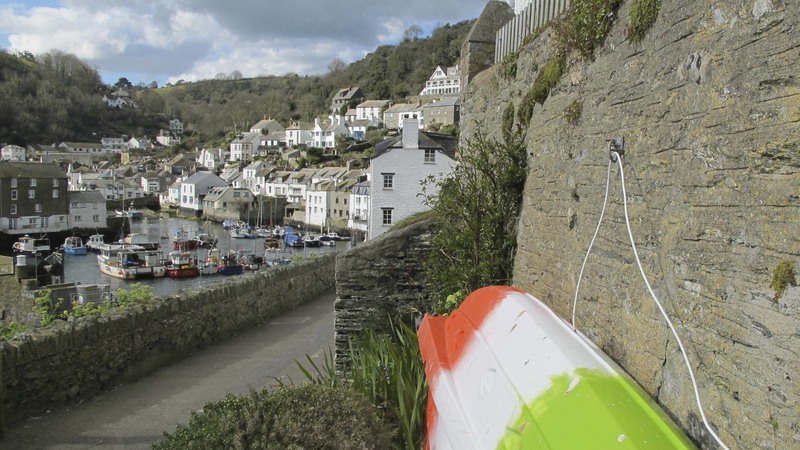 Polperro does have a special magic and I know what you mean about feeling you’ve had a life there before. The western highlands of Scotland feel that way for me.